It is very simple to have a buffet tea at home. When planning your floral arrangements and decor, be mindful to choose scents that will not cause reactions to your guests. The flowers and decor are meant to complement your tea setting, not overpower the guests, nor interfere with the taste of the foods. While a white linen table cloth with matching 12-inch napkins is traditional, in our contemporary world, it is also appropriate to use whimsical cloths of various materials and designs. Set up opposite ends of the table with the tea cups and saucers, tea spoons, plates, napkins, sugar cubes, milk, and lemon slices. One end of the table will serve the hot tea. If room allows, serve one blend each, decanted, of a black, green or oolong and herbal infusion. By serving the tea decanted, there will be no need for tea strainers or slop bowls to remove the discarded tea leaves. The other end of the table will serve the hot coffee, with sugar cubes and milk/cream. Again, if room allows, offer your guests both regular and decaffeinated coffee. On a side table have a pitcher of cold, brewed iced tea with tall iced tea glasses. In the middle, on one side of the table, have serving trays, each containing a different type of savory and finger sandwich, crusts off. Balance the menu with no two breads or fillings duplicating one another. And for goodness sake, if you live in a southern state, do not forget the deviled egg tray! In the middle, on the other side of the table, have serving trays, each containing a different type of finger/bite size sweets. Lemon pound cake and brownies may be cut into bite-size servings. On either a side table or next to your savory trays, set up baskets of mini, bite-size, scones, muffins and slice-finger style fruit breads. You may also include cheese sticks. Place bowls of clotted cream or Devonshire cream and jam, with small serving spoons, and bowls of large strawberries adjacent to the breads and scones. Place coordinating service pieces next to or near the trays. 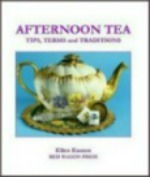 You may use place cards, on the tables, to identify each item and tea served. Sherry, port, and champagne, if desired, may be served on trays or passed by the wait staff. Remember to keep the menu simple with easy to pick up “finger foods” that do not require utensils. A buffet tea needn’t be expensive, nor time consuming to prepare. There are many marvelous sources available by mail order and in your local supermarkets. 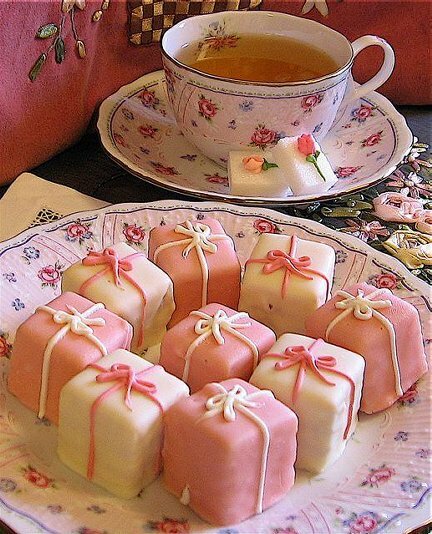 All it takes for one to create a beautiful buffet tea party is imagination and a good guest list.